Raspberry Pi OpenVPN is a great way to access a home network from a remote location. In addition it can be used to secure network communications when connecting to public Wi-Fi. Since the RPi is very low-powered single board computer it is ideal for setup your own Raspberry VPN server with OpenVPN. OpenVPN comes with Easy_RSA, a simple package for using the RSA encryption. Let’s find out how you can how to setup OpenVPN on Raspberry Pi device. One possible scenario for wanting your own VPN server that while you are away from home and would like to be able to access all devices on the network at home in a secure manner and you can use public Wi-Fi but you can secure your connection to the world. VPN act as a secure tunnel that start from your device to your VPN server. Lets update raspberry pi OS and firmware by issuing following two commands from shell, i prefer to use Putty but its up to you what ever you want to use to remote connect your Raspberry Pi. Enter following command to begin the openvpn installation. OpenVPN comes with easy_rsa, a light and easy package for using the RSA encryption method. This is what makes your VPN connection safe. if easy-ras isn’t installed then you can do so by running following command. "HEAD is now at 19c3186... creating 2.x branch for tracking changes"
Enter all relevant information, this could take some time to finish. 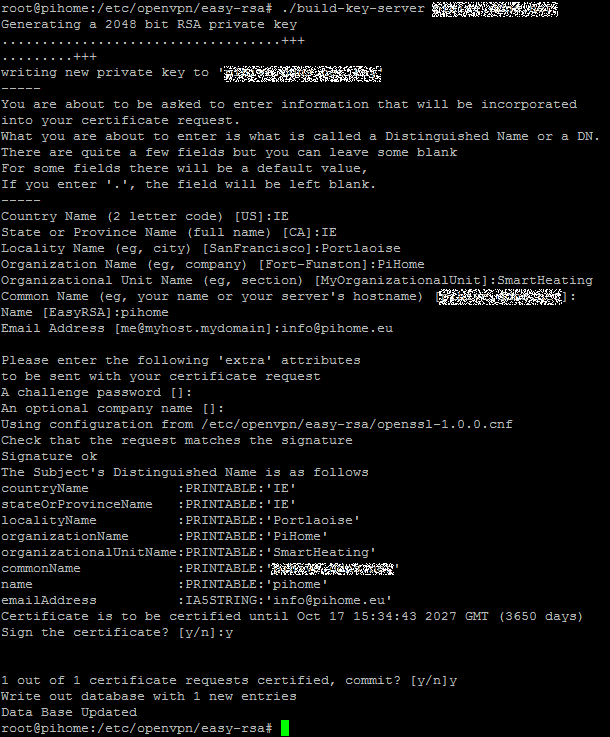 Now we’ll create a certificate for and name the server. I named mine vpn.pihome.eu but it really doesn’t matter. Enter all relevant information and make sure you don’t enter anything for a challenge password it must be left blank, once server certificate is created it would stay valid for 10 years. Now you can create certificate for each client or you can generate one certificate and use this on all clients. run following command, you can use any user you want to use, make sure you enter the username that you can easily remember. You can enter all default values but password for Enter PEM pass phrase that you can remember, this will be used every time you connect to your Raspberry pi OpenVPN server. Now we need to change the keys to an ds3 encryption scheme. Enter the Enter pass phrase for pihome.key: as you did in previous step. Lets generate Diffie-Hellman keys for your server. This process will take very long time so best to get coffee and sit back and enjoy your coffee. Now we need to configure OpenVPN Server to get connected. You need to create server.conf file and copy and paste my server.conf settings, you can modify as you need. proto udp # i prefer udp port but you can change this to tcp. port 1194 # this is default port for openvpn you can change this to any thing you want. push "route 192.168.99.9 255.255.255.0" # change this with your raspberry pi ip address. push "route 192.168.9.0 255.255.255.0" # change this to your home network range. OpenVPN server is fully configured but raspberry pi OS comes with built-in firewall and it blocks all incoming connections. rung following commands and make sure you don’t get any errors. if above two lines don’t give you any error then you are good so far. Create sh file and copy and paste below text to. Make this script executable by issuing following command. First create Default.txt file at /etc/openvpn/easy-rsa/keys/, copy and paste below to this file and save it. make sure you add your public ip or ddns hostname. Second step to export client settings that are usable on any smart phone or desktop/laptop computer. 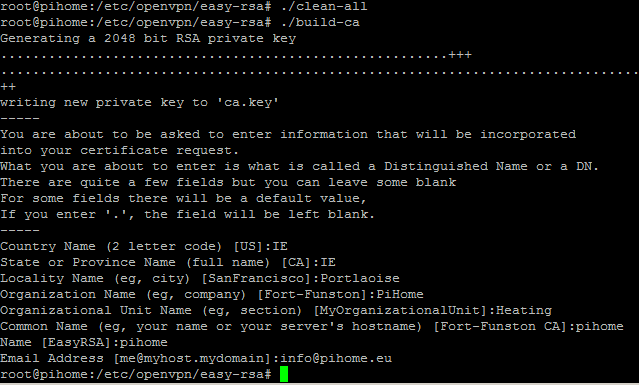 create makeovpn.sh in /etc/openvpn/easy-rsa/keys and copy paste below script to this file. echo "[INFO]: Client 3des Private Key not found: $NAME$KEY"
echo "[ERROR]: Client Private Key not found: $NAME$KEY"
Change directory to /etc/openvpn/easy-rsa/keys and make makeovpn.sh file executable make sure you run this script from /etc/openvpn/easy-rsa/keys otherwise you will get error message and exporting of OVPN wouldn’t work. cd /etc/openvpn/easy-rsa/keys/ chmod +x makeovpn.sh sh ./makeovpn.sh Enter Username that you want to export settings for. Enter Username that you want to export settings for. Repeat this for this process for all the users you have created. OVPN extension file will be saved with same name as you have username in /etc/openvpn/easy-rsa/keys/ you can use winscp or any other client to copy these files out. i use two virtual interface (static ip, dhcpcd service disabled) eth0 and eth0:0 on the same physical ethernet – the first for public internet access, the second to connect mobile apps back to the raspberry from the public internet, or connect via ssh (dyndns, port forwarding). It’s possible to bind the openvpn client to one of the virtual interfaces (ex. eth0:0)? @Peter i dont see that as problem, all you have to do is modify your server.conf file and iptables for that interface. Would you be able to update this article for Rasbian Stretch, or has the proces remained unchanged? Hi Andrew, i dont see any reason for any major changes but i haven’t tested this on Rasbian Stretch. you can give it try and let me know if these steps down works.